Tukuihama Mikan Picking (津久井浜観光農園みかん狩り) is a popular activity in late Autumn at Yokosuka, Kanagawa Prefecture. Mikan is Japanese Tangerine and sweet fruits in Japanese Fall. 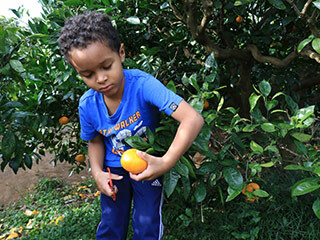 In this fruits picking, you can pick up the fresh Mikan from the farm and eat as many as you want at the farm. If you want to take Mikan to your home, you can buy them that you picked at the farm. It is a very popular kid's activity in Yokosuka. Admission: 650 yen for adults, 450 yen for 3 to 6. Free for under 3. 0. at Yokosuka Chuo Station. 1. use Keikyu Line to Tsukuihama station. There is a shuttle bus from Tsukuihama station. Tsukuihama Mikan Picking is held at Tsukuihama Tourist Farm at Yokosuka, Kanagawa Prefecture. There are many Mikan farms around the office of Tsukuihama Tourist Farm and every time, the farm of Mikan Picking is different so that you can always pick up the fresh Mikan. You can eat as many Mikan as you want at the farm, and if you want to take them home, you can buy them at the farm. Price will be different at each farm.